A new study led by scientists at the Woods Hole Oceanographic Institution (WHOI) points to the deep ocean as a major source of dissolved iron in the central Pacific Ocean. This finding highlights the vital role ocean mixing plays in determining whether deep sources of iron reach the surface-dwelling life that need it to survive. “Our study is a long-term view—over the past 76 million years—of where iron has been coming from in the central Pacific,” says Tristan Horner, a postdoctoral fellow in the Marine Chemistry and Geochemistry Department at WHOI and lead author of the paper to be published February 3, 2015, in Proceedings of the National Academy of Sciences. While many areas of the ocean are rich in other nutrients, they often lack iron—a critical element for marine life. Iron is particularly important for the growth of phytoplankton, which are tiny plant-like organisms that form the base of the ocean food chain and play an important role in Earth’s climate. In addition to producing about half of the planet’s oxygen, phytoplankton live at the ocean’s surface and act as sponges of carbon dioxide—a heat-trapping gas. Through photosynthesis, phytoplankton take carbon from the air into their bodies. When they die or are eaten, much of the carbon sinks to the deep ocean, where it cannot re-enter the atmosphere. The scientific community has long thought that the vast majority of the ocean’s iron comes from atmospheric dust, with smaller inputs from dissolved sediment along continental margins, and fluids from hydrothermal vents, which are mineral-rich hot springs on the seafloor, miles below the surface. Iron is readily soluble in low oxygen regions at hydrothermal vent sites and along continental margins, but it was believed the iron remained in these localized spots and didn’t contribute much to the overall iron content of the ocean. “According to conventional wisdom, as soon as these iron-rich fluids hit seawater with high oxygen concentrations, the iron would just dump out and never really go anywhere,” explains Nielsen. To conduct their research, the researchers analyzed a marine sediment, called a ferromanganese crust, taken from a spot far from any hydrothermal vent sites in the central Pacific Ocean. The sample was collected from the flank of the Karin Ridge, a seamount located in the central Pacific, in the 1980s by coauthor Jim Hein of the U.S. Geological Survey (USGS) in Santa Cruz, from a dredge along the seafloor. The team used a mass spectrometer to analyze the sample for long-term changes in seawater isotopic chemistry recorded in the growth layers of the ferromanganese crust, which forms very slowly. Drilling cross sections in the sample allowed scientists to look through “sections of time” to analyze variations in the composition of iron isotopes—stable natural isotopes iron-56 and iron-54—in order to track the origins of iron. “The ratio of iron isotopes vary among the different iron sources—atmospheric dust, hydrothermal vents, and dissolved sediments— and are actually quite distinct, like fingerprints. We were able to measure those ratios in the growth layers of our sample, which tells us about where the iron came from and how the different iron sources have waxed and waned over time,” Horner says. “This study is exciting in that it applies some of the recently developed metal isotope capabilities to parse the different sources of scarce iron in seawater going back through time, and builds on the emerging story about the importance of hydrothermal vents to the inventory of iron in the sea,” adds Mak Saito, a biogeochemist at WHOI and one of the coauthors of the study. The researchers hope to use this technique to look at iron sources in other parts of the ocean. Future studies could help answer lingering questions about global iron budgets, the influence of iron on climate, and how hydrothermal vents affect the ocean as a whole. Researchers from Durham University and the University of Oxford in the U.K, and the USGS also contributed to this study. The work was supported by the WHOI Postdoctoral Scholar Program, with funding from the Doherty Foundation. Additional funding came from the Natural Environment Research Council, European Research Council, and the Gordon and Betty Moore Foundation. While many areas of the ocean are rich in other nutrients, they often lack iron—a critical element for marine life. 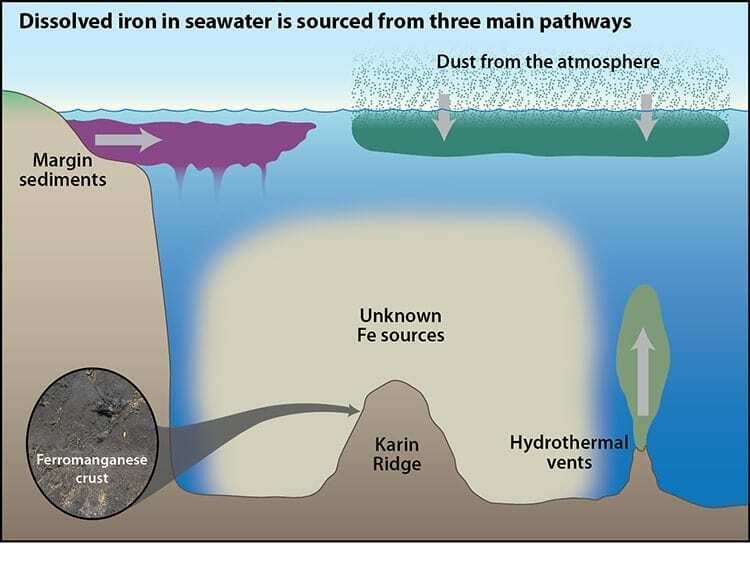 Dissolved iron in seawater can originate from three main sources: dust from the atmosphere, sediment dissolution along continental margins, and fluids from hydrothermal vents. 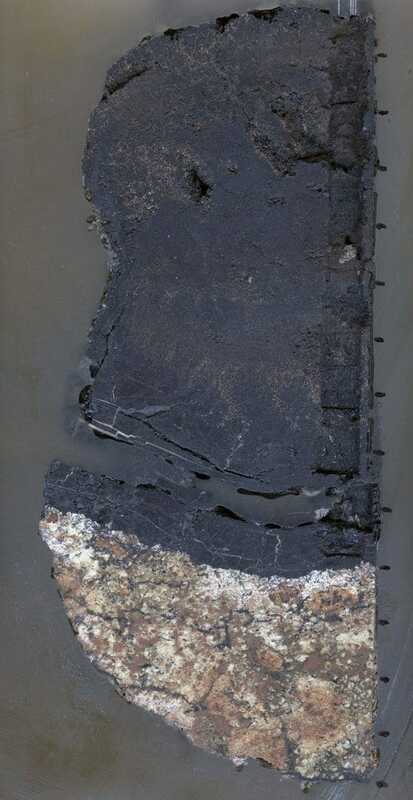 Using a mass spectromemter, the ferromanganese crust sample (above) was analyzed for long-term changes in seawater isotopic chemistry recorded in the growth layers of the crust, which forms very slowly. Drilling cross sections in the sample allowed scientists to look through "sections of time" to analyze variations in the composition of iron isotopes—stable natural isotopes iron-56 and iron-54—in order to track the origins of iron. 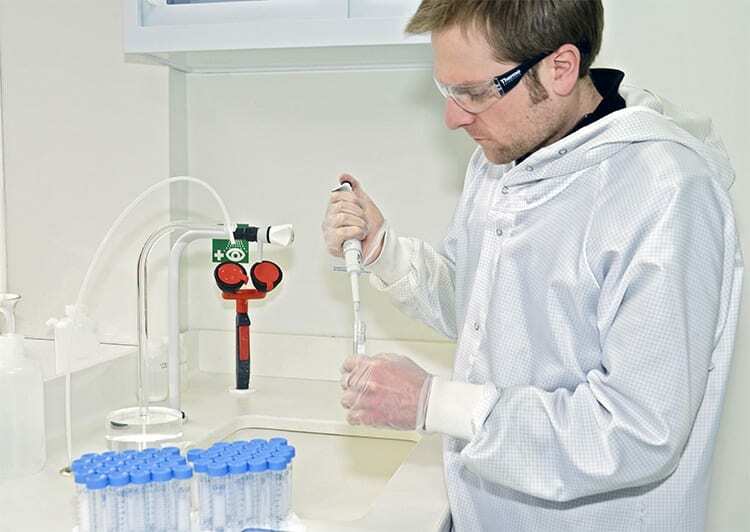 "The ratio of iron isotopes vary among the different iron sources—atmospheric dust, hydrothermal vents, and dissolved sediments— and are actually quite distinct, like fingerprints," says lead author Tristan Horner, shown here working in Sune Nielsen's NIRVANA clean lab.